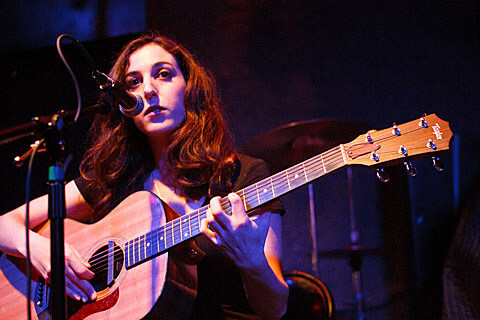 Dream folk singer Marissa Nadler is on a roll lately, having released her self-titled album in 2011, followed by 2012’s The Sister, and now she’s got another LP, July, coming out on February 4 in the US. After releasing her last two albums on her own Box of Cedar Records, for this one she’s signed to Brooklyn goth/punk/etc label Sacred Bones. Earlier this year, she sang on “Villain” (stream below) off the new Case Studies album (out now on Sacred Bones), and in late 2012 she opened for Sacred Bones recording artists Jozef Van Wissem and Jim Jarmusch in NYC. The album comes out a week later (2/10) via Bella Union in the UK. She recorded the album with producer Randall Dunn, who has worked with multiple (mostly post-metal, drone, psychedelic) artists including Wolves in the Throne Room, Sunn O))), Earth, Jesse Sykes, and more. It also features strings by Eyvind Kang (who has worked with Blonde Redhead, The Decemberists, Sunn O))), Laura Veirs & more), synths by Steve Moore (not Zombi Steve Moore, but another Sunn O))) and Laura Veirs collaborator), and guitar by Phil Wandscher (Whiskeytown, Jesse Sykes & the Sweet Hereafter). The first single from July is “Dead City Emily,” a track as haunting and delicate as any of her best tracks to date. You can stream that one, along with the new album’s tracklist, below. Marissa was recently in NYC for the Elliott Smith tribute at Glasslands, and she’ll be returning for a free in-store at the new Williamsburg record store/venue Rough Trade NYC on Saturday, November 30. It’s a day show, starting at 1 PM. Marissa also contributed to likeminded folk singer Emily Jane White‘s new album, Blood Lines, which comes out November 19 via Important. Marissa sings on the track “Faster Than the Devil,” which you can stream, along with another album cut, “Keeley,” below.